Jennifer Skiff takes the reader on an epic journey and delivers a series of accounts that address the connection between humans and animals. Through a multitude of case studies, she focuses on the importance of recognizing how the reciprocation of kindness between the two kingdoms is essential. Ms. Skiff’s inspiration to write this book begins with her visit to Vientiane, Laos. Landlocked by China, Vietnam, Myanmar, Thailand, and Cambodia, she and her Australian boyfriend, Jon, were deposited in the lush jungles of a world quite different with its warm and humid air. On one particular day, they venture into the National Ethnic Cultural Park; located twelve miles south of the Vientiane. Ms. Skiff’s agenda was to learn about the history of the country - little did she know her history lesson was about to present an eye-opening encounter. As they made their way further into the park, the two came upon a ten-foot-high statue of a Buddha surrounded by a circular pathway. To its side was a six-foot-high, bell-shaped cage encased by iron bars. Its tenant was a black Asiatic bear. He’d clearly outgrown the cage some time ago. He was covered in blisters and as Ms. Skiff scanned the cage further for signs of waste, there was none—an indicator this bear wasn’t being properly nourished. When the park tender approached Ms. Skiff and her boyfriend, their exchange began with: 'You like bear?' Jon responded, ‘This is an unacceptable situation for any animal.’ To which the park tender insisted the bear was happy. The deeper the two delved into their exchange, the more Ms. Skiff’s mind came up with ways to make a difference not only for this bear, but perhaps the lives of those to come. So began her journey of chronicling and traveling the world to document many infractions against animals and their loss of freedom, disallowing them to be what they were meant to be. I enjoyed Ms. Skiff’s book immensely. There are a variety of places and accounts that range from the exotic and remote to the picturesque and quaint locales she visited and documented. She displayed a tangible ability throughout this read to draw her audience in and share her experiences through descriptive scenes and narratives as well as succinct dialogue. There are times when I’ve read accounts of mistreatment of animals and the stories written by their respective saviors. At the end of the read, I was left with a sublime sense of ‘pulpit pounding’ by the author. This was not the case with Ms. Skiff’s Rescuing Ladybugs. Rather, with her journalistic background, she managed to deliver a story-line as much as a fact-telling mission. Well done. Quill says: The world is full of Ladybugs to be rescued. 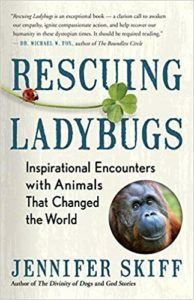 Rescuing Ladybugs is a great resource toward the positive outcomes of taking action.